Akasaka (赤坂) is located almost the center of Tokyo and it is one of the established in Tokyo. Because there are many embassies in Akasaka, there are high class hotels and restaurants. Akasaka is named after the Akasaka gate which is one of the gate of Edo Castle. There are also some historical spots in Akasaka. There is restroom at Shimizudani Park. 1. use Marunouchi Line to Akasakamitsuke. ... was one of the gates of Edo Castle. It was Masugata gate, the square gate, and located the outer moats. Stones of the gate are still existed. 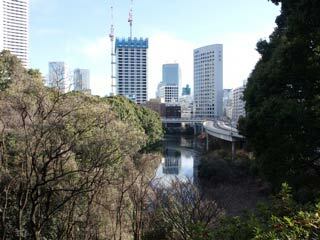 ... is one of the outer moat of Edo Castle. ... was another ruins of the gate where Iwakura Tomomi, one of the Meiji Restoration heros, was assaulted here. is where Okubo Toshimichi, one of the three heros of Meiji Restoration was assassinated here in 1878.